This is written to provide you with tools to help you and your child adjust to the idea of wearing an eye patch and "recipes" that you can use to achieve your goal. No parent wants to feel like the "bad guy". In most cases patience, persistence and support, along with smiles and warm hugs will comfort everyone. The most important way to ensure the maximum effectiveness of your child's eye patch is to follow instructions. The amount of time your child will be required to patch depends on his/her age, the severity of the problem, and the type of problem. Your goal is to reach the number of consecutive hours prescribed. For younger children, you may want to begin slowly and increase the patching time as your child adjusts to the patch. WHY DO I NEED A PATCH? According to recent statistics, approximately one out of every 25 preschoolers has a vision problem, that if left untreated, can result in some decrearse in vision. Approximately one in four school-aged children have some form of vision impairment that will requrie corrective treatment. In a child without any visual problems, the eyes work in tandem (together), resulting in good vision with both eyes. The ability to focus and see improves rapidly throughout the first year of life. There are two common childhood conditions that are of concern to ophthalmologists, amblyopia (lazy eye) and strabismus (wandering eye). Lazy eye develops when one eye doesn't see as well as the other. The brain tends to favor the stronger eye, and over time comes to rely on it exclusively. Lazy eye can lead to a permanent loss of sight if left untreated. The treatment is usually patching. Strabismus (wandering eye), a misalignment of the eyes, is typically caused by the failure of the eye muscles to work together. About half of the children with strabismus are born with it, the other half develop it before age five. In this case, the eyes may turn in, out, up, or down. As a result, both eyes may not be able to focus together. This can also cause lazy eye. The good eye (stronger eye) is patched to encourage the development of better vision in the "lazy eye" (weaker eye). 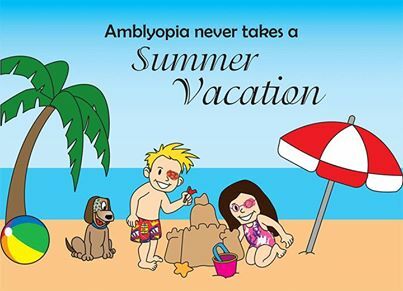 Amblyopia can be caused by unequal refractive errors (different focusing ability), misaligned eyes (strabismus) or other medical conditions. Patching is most effective when it is begun as early as possible. The length of time a child needs to wear an eye patch will vary. Pick a time when you and your child are not tired or hungry (if possible). Allow the child to see and play with the patch at home and explain that the patch will be worn for a period of time each day to help him/her see better. Experience has taught us that the best place to begin patching may not be at home but someplace new and visually stimulating, a mall, a park, during a play group or visit to a toy store. If beginning at home, introduce a new activity at the same time that you introduce the patch: new video game, computer game or new interesting toy or art set. Introduce the patch once your child is involved in an activity, such as being surrounded by toys in the store. Put the patch on and keep a conversation going. If your child tires of the toys, move to a new area and show him/her different toys. Depending on your child, the patch may be only successfully worn for five minutes, or he may be cooperative for up to an hour. Once you sense your child's frustration is getting too high, remove the patch and compliment them on how well they did. Tell them that tomorrow they will have another turn to wear their eye patch. On the second day, try a different activity. Once again engage your child in an activity, like going to the pet store where they can play with the puppies. After adequate time has passed, remove the patch using your most enthusiastic voice, compliment them. Repeat this process every day for approximately two weeks. Gradually, build up the patching time as quickly as possible, until you have satisfied your doctor's prescription. Preschool children are often successfully patched at school since they are busy and occupied. Play activities such as tumbling classes or gym classes are wonderful times for patching as children are active and distracted. Bringing other children or adults along is often helpful because it adds to the distraction and helps accomplish your goal. Kitchen activities can be very exciting...bake cookies, make pudding, peel fruit, finger paint with chocolate pudding...keep the activities interesting and varied. If your child attempts to remove the patch, simply put another one on. Explain that mommy and daddy are in charge of the patch and will take it off when the time is up. Immediatlely introduce a new activity. Be patient, but firm about the need to leave the patch on. Sometimes a timer can be helpful. Some comments and questions made by others may be kind and well meaning and merely an expression of curiousity. Others may be tactless and rude. Strangers' questions and reactions will affect you in different ways on different days. If you choose you can simply say "the patch helps the weak eye become stronger; they will be just fine". There are times when you are too busy or preoccupied to answer, it is perfectly acceptable to simply excuse yourself. If friends and relatives ask what they can do, don't be shy. Ask for help by allowing them to go with you on your daily outings or occupy your child while they are patching. If you have a school aged child, teasing can be a problem. We have found that direct approach works the best. Teach your child to respond to teasing by saying, "you're right, I wear a patch to help my vision" or "I guess you noticed my eye patch. It helps me to see better if my eye is patched." Usually children doing the teasing will lose interest if the issue is addressed without defensiveness. Although it may be difficult at times to see other people stare at your child or tease your child, keep in mind that you are doing the right thing. Eye patching can cause anxiety and confusion at first, but with time, patience, persistence, and support, your efforts will be rewarded.